My money was on the PlayStation Classic dropping to this price point first. £1.49 to get this from their bin, into my bin...bargain! I have a 360 in the loft, but want a Kinect for something else - They're fantastic for making 3D scanners. You can plug them into your computer and scan objects in real time. Great for people with 3D printers. 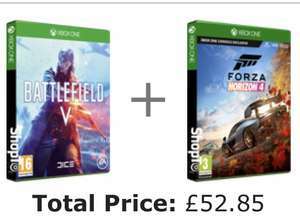 I just got 2 copies of Forza as both boys want it and 26 odd is a good enough deal for me! Thanks op I'm working my way through the games list for Xmas! A lot of the complaints I've seen are less about the game and more that it has a dismal amount of content resulting from the fact they're treating it like a 'live service' for player retention. Probably part of why it's shot down in price being that people are already done with what's presently in the game and it didn't have great sales in part from the horrendous marketing anyway. Being part of a double bundle though, you'll be able to switch between the two on and off if you like 'em so this is a pretty nifty deal. Seems that way, I’m sure they will be a tenner each by the end of Jan. Fallout 76 steelbook is a beaut, can't say the same about the game. 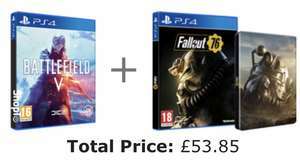 Not that bad of a deal, but Fallout's price is sinking faster than the Titanic. How can a refurbished console actually be worth £450? How is £250 for a console that is probably actually worth it's rrp of £450 not a great deal? Not really a great deal. Only Xbox sadly, won't work on PC. Tesco Ireland has PS4 slims for 183, Xbox Ones + plus Kinect for 140. Clarehall you say.....................they are marked as €199 for the ones with Kinect. Funny thing is your right it does come across as trolling. But im being deadly serious! I genuinely want to buy 1 but then i cant find any of those "must have" games to go with it - all i see is forza or gow? I found a discount code online for gameseek ‘tenner’ and mentioned this when I asked ao to pricematch and they said no problem and reduced the price to £389.99 with free next day delivery. Mine arrived today. Seems like a reasonable price for this delivered. I believe the GameCollection one is the V1 without 3.5mm jack while this one is the new V3 with Bluetooth andnew design. Theres a post about on here somewhere. Never miss a 'Xbox Kinect' deal again! Just ordered with that code for same price so unexpire? Not £14:99,£34:99 online.Cold as these are great dust collectors. Cheapest I've seen a Kinect Sensor, £15 in store or £17.50 delivered. Includes a 24 month warranty too. The whole shebang. I even have a degree in this stuff. So sad to watch my daughter stood in exactly the right position saying 'xbox on' about eighteen times until it eventually responded. Positioning, configuration, ambient noise all standardised and set, but unfortunately just like pretty much everyone else just gave up on it. Yes please. Is this the adapter and Kinect? if so let me know how much you want for it. I use one on my PC for Windows Hello. 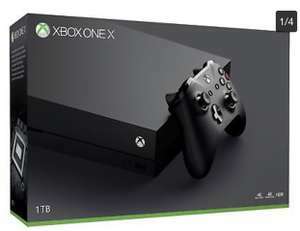 Looking for a xbox one s. Or maybe the elite model. CEX generally seems the cheapest price. Again, agree to disagree. I'd consider your post a deal as I hadn't seen it at that price you mentioned. I'm new to gaming so perhaps why. My point was is that if it's available cheaper, why not shout about it. We'll have to agree to disagree then. It would be good to see a link to a cheaper deal, that's all I'm saying. You can do all of that for free, with an Iphone/Android phone. It's a good price for that product, but these days I don't think there's any benefit of this switch over the £20 dimmer switch. What?! Do you logon using 'p***s recognition' or something?! Except it's not completely useless is it? All the functions it used to have... Guess what? It still has them... It might not have any NEW features or games, but everything that has ever been made for it, and all the functions (voice commands etc) all still work. Mine is still in use all the time. And Kinect Adventures is a blast of fun. A brilliant idea, sadly now completely useless due to a complete lack of support, not least from MS themselves. A real shame. one thing do you get the DLC included? I'm selected a bear that was part of DLC but i got it anyhow. Many thanks my kids and me loving it. The way I did it was. Open ie login at regular Xbox page. Then click the link on here opens up a new Xbox tab in JP all logged in and just click to buy as normal. Thanks OP this worked a treat! I have decided to buy a used Kinect sensor from elsewhere as they are quite cheap. Can anyone recommend any games apart from Kinect Sports Rivals? Cold because you can't spell Kinect. ffs ...I am not writing a novel here.. get a life.. pretty please..
​Not as bad as "adopter"
Hahaha... Kids these days eh! Thanks for the info, I'll check out the Elgato thingy-mi-bob. Don't forget you can use it on windows 10 for windows hello if you have the adapter. How depressing, pretty sure I paid about £400 for this when it came out. Just picked up the last one in wantage sainsburys so there are some out there still!